I can still remember the first piece of French pâtisserie I ate, aged 18, on a hot summer day in Brittany. We came out of the bakery with our paper-wrapped slices and sat on a wall in the sunshine to eat them: my very first taste of tarte aux pommes. The pastry was flaky and buttery, the creamy layer of crème pâtissière melted into the thinly sliced apples, slightly burnt at the edges and brushed with shiny apricot glaze that stuck to our fingers. It was unlike anything I’d ever tasted, and I knew I wanted to stay in France forever, so I could eat like this every day. I don’t think I’ve ever found quite that tart in a pâtisserie since; most of them lack the custard layer and just have plain sliced apples, or a layer of tart apple purée. Delicious all the same, but when I encountered Jane Grigson’s apple tarts from Evreux in Good Things in about 1980, I gave a cry of recognition and set about perfecting them. It took a while, but eventually, after several tweaks to the recipe, my own creations were as wonderful as I remembered that first slice being. And then I stopped making them, turning to slutty Tarte Tatin as my go-to apple tart recipe. Whatever anyone says about the complexity of Tarte Tatin, it is frankly a doddle to make. All you need for complete success is to burn the apples, butter, and sugar, and how difficult is that? The worst of cooks can do it. It’s always baffled me that people try to make it look so complicated. This tart is a lot more fiddly and time-consuming, but if you didn’t like spending time in the kitchen, you wouldn’t be here, would you? In any case, you can make the pastry and crème pâtissière in advance and put them in the fridge till needed. Blind-bake the pastry and assemble the tart just before the meal, put it in the oven, and serve it either freshly baked, or lukewarm. I think this looks loveliest if you bake small individual tarts, but you can make a single large one instead, using an 18-20 cm loose-based tin. Either use your own favourite sweet shortcrust, or the recipe below. This will make more than you need for a single 18-cm tart; use the rest for something else, or freeze it. Rub the butter into the flour. Stir in the icing sugar, then lightly beat the egg with a little cold water and stir in. Bring the pastry together in a ball, wrap in a plastic bag, and put in the fridge for an hour. Remove about half an hour before you want to use it. This is an all-purpose recipe that can be used for all sorts of other tarts and desserts too; for example a simple fresh fruit tart. It’s less nerve-racking than making ordinary custard, because the flour means that it won’t curdle even if it boils. Warm the milk in a saucepan until it is just at boiling point. Meanwhile beat together all the other ingredients except the butter. Pour on the hot milk, whisking all the time, then pour into the saucepan and return to a low heat, whisking all the time until the sauce is very thick. It’s perfectly OK for it to boil, but don’t use a high heat or it may stick and burn. Cook for a couple of minutes, stirring all the time, until it doesn’t taste floury any more. Pour into a bowl and dot with bits of butter, then place clingfilm over the surface to stop a skin forming. Leave to cool. Jane Grigson made hers with Golden Delicious; that was one of the first things I changed. You need firm, tart eating apples; Granny Smith or Cox’s are good. For the glaze, you can use apple or quince jelly if you have any, in which case add a little glug of Calvados. If you use apricot jam, sieve it after heating. Preheat the oven to 180C. Roll out the pastry, line the tin or tins, and blind-bake for 10 minutes. Remove paper and bake for another 5 minutes, until the pastry is very lightly coloured. Meanwhile, peel, quarter, and core the apples, then slice lengthways into thin, even slices. Sprinkle with lemon juice if necessary to stop them browning. Increase heat to 200C. Spread an even layer of cold crème pâtissière in the pastry case. Then arrange the apple slices in concentric circles like the petals of a flower, starting from the outside and overlapping the edge of the pastry slightly. Make a rose shape in the middle. Heat the jam or jelly in a small pan with a little water until it is runny, then use a brush or spoon to spread it carefully over the apples. Put the tart in the oven and bake for about 30 minutes, glazing it with any remaining jelly about halfway through. The apples should be starting to burn at the edges. Remove from the oven and serve proudly. Do not bother with cream – it doesn’t need it! I know what I’m making for pudding on Christmas Day now, thanks Veronica! It’s not as time-consuming as it looks 🙂 Peel and quarter the apples, remove cores, then slice each quarter vertically into thin slices. Use your fingers to keep each quarter together, and you can simply fan out the slices of each quarter as you put it on the tart. Scrappy little slices can be set aside and used to fill gaps or to make the central rose. Yes, nice idea! I love almonds with fruit and always add them to apricot or pear tarts. Excellent. 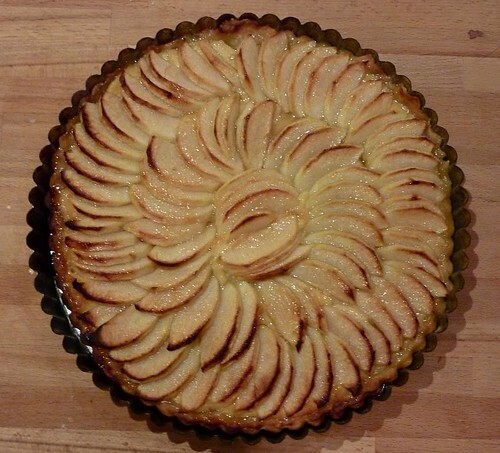 I’ve been wanting to make this for some time, i was convinced it was as simple as baked pastry/cold pastry cream/sliced apples/oven, but i couldn’t find anything to confirm (i looked through a lot of French recipes but for some reason they use a microwaveable pastry cream???). Great, let us know how it went! I’m most impressed by your blog, BTW. That sourdough bread! Greetings from Yorkshire. I stumbled upon your blog thanks to this post… love the Proustian recollection of your first tart. I’m quite taken with French cooking at the moment so, thanks to your recommendation, I’ve just picked up Mireille Johnston at Amazon for £3. Bargain. I’m looking forward to popping by from time to time. Keep up the good work. An excellent investment! Mireille’s is one of my favourite cookbooks — you can’t go wrong with her. The TV series was really good too. I managed to track down both series of the TV show and thought it was wonderful – one of the best cookery programmes I’ve seen. Thanks again. I”m thinking of making mini-tarts for my daughters’ birthday using a muffin pan. WOuld this recipe work ? How long would I have to bake the mini tarts? Absolutely! Give them 10 minutes before checking on them, they might need five more. They do look lovely small – I do them in small tart tins about 4″ across. Hmm . . I have only 3-4 small tart tins and so it would take me forever to make 2 dozen tarts that way. Which is why I thought muffin tins but don’t know how nicely that would work. I think I may do a test run before the birthday. Thanks for your advice! This was a perfect recipe! I made today for a brunch and it came out beautifully. Thank you for posting this recipe – reminds me of my student days in France! Hey, that looks really amazing. I thought I should try it tomorrow or day after tomorrow. But I have this one question. Can I make Crème pâtissière one day earlier and put it into fridge to wait next day? or does it go bad? It’s fine to make it a day in advance and store it in the fridge.